Corner Curtain Rod Connector for Continental curtain rods offer another solution for corner window drapery and curtain applications. It connects two wide bodied continental curtain rods for corner window. Just because you have a corner window does not mean you do not have choices for the type of curtain rod you can use for the installation. Bracket shims can be used behind shade, pleated shade and others to build out your existing brackets to clear objects for installation. 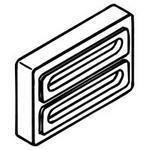 These clear bracket shims are 1/4 inch thick and can be stacked behind the bracket. Remember to use longer screws for attachment. If using behind drapery and curtain rods, extension support brackets are available for brackets that do not have a flat surface for mounting. Keep turned for more ways to make it happen when the job at hand demands a little more thought. Somfy Motors: Prices reduced on all Somfy motors for interior window covering products. Glystro drapery rod and motor to shade and blind motors, all reduced to low, low prices. 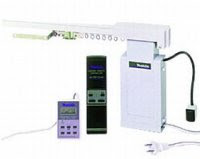 All accessories are available for complete installation. Hard to get to windows can be controled with radio or ir receiver or wall switch. Ac motors and battery pack motors available now at the best prices of the year. 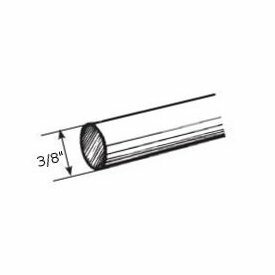 9/16" Wide Cafe Rods 66"-120"
Cafe Rods:— When looking for cafe rods for wide windows remember that the wider the span, the more supports you will need to support the curtains. On the other hand, a larger diameter of the cafe rod can support more weight with fewer support brackets.This is important because some curtains have built in loops to run the cafe rod through. These loops cannot pass by the support brackets. This is also true of the standard rings for cafe rods. Some cafe rods offer a C-ring designed to pass by the support brackets. A baton is also available with a C-ring attached to make opening and closing your curtains a snap. Holdbacks - Now that you have your drapery installed, you may be looking for something to "hold" them back on the sides of the window. That's where the extreme line of holdbacks from BasicQ comes in. You have many styles and colors to select from to match almost any combination of curtain rod color and style. Holdbacks may also be used to create a draped swag look on arched shaped windows. 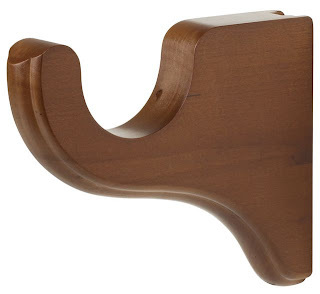 They can also be used for other projects around the house, like towel holders with style. It may be a little extreme to let your kids use them for wheel caps on their backyard buggy, but let your imagination run wild to come up with extreme uses of this product. 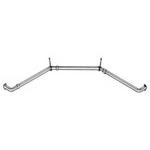 Bay Window Curtain Rods: This Kirsch bay window curtain rod is simple to install and adjustable to fit each section of your window. It is designed to handle simple curtain installation where you insert the curtain rod into the hem . Comes complete with mounting brackets and supports. Made from steel, finished in white. Simple, inexpensive way to treat that bay window. Corner Windows:Standard corner curtain rods can cover windows up to 48 inches on each side. You can cover wider windows with wood and metal curtain rods. These are available up to 12 feet and can be attached to fit wider windows. Matching brackets, rings and finials are available. Double brackets are available on some selections for double curtain treatments. To use wood and metal rods, the swivel socket is designed to attach two rods in the corner. These are adjustable from 90 degrees to 180 degrees, so you can actually use it for windows that that come together at any angle up to 180, which of coarse would be a flat wall. Bay and bow windows can also be fitted using the swivel socket. Don't forget, you have to have wall space for the brackets. Corner windows present a unique challenge when trying to cover it with curtains and drapery treatments. 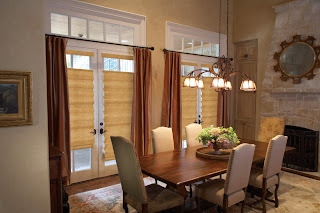 There are many ways to accomplish this with wood or metal curtain rods. From a basic corner curtain rod for a set of curtains, to elegant wood or wrought iron curtain rod poles, it is possible. Swivel socket, or elbows, can be used on wood poles up to three inches in diameter. and on metal wrought iron rods to one inch in diameter. Custom curved traversing rods are also available in regular and heavy duty aluminum tracks from Kirsch and Graber. These can be used with pinch pleat draperies or ripplefold draperies. Regular traverse cords or batons can be selected for opening and closing, or you may decide to motorize your drapery treatment. Yes, it is all possible and BasicQ is here to help you plan your design. Drapery Weights Sometimes it's the simple things in life that are hard to locate. Drapery weights are inserted into the bottom hem of drapery fabrics to make them look better at the window. More than one type of weights are available and all accomplish the same task. You have the fabric covered individual weights as shown here, and you have the rope, or beaded weights that look like a continuous string. Ceiling Mount Bracket for 1 3/8 inch and 2 inch wood pole curtain rods now available. These are good for areas where the window or sliding glass door goes to the ceiling leaving no wall space for mounting wall brackets. It is made from resins and comes in coordinating colors to smooth and fluted Kirsch wood poles. Traverse rods come in many styles including decorative finishes. Decorative rods are designed to hang your curtains and draperies below the rod, displaying the bright brass, black, brushed nickel or antique brushed brass finish. Decorative rods can have plain slides or ring slides to attach your draperies. 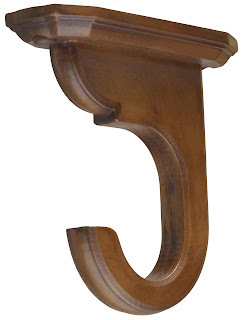 The set comes complete with brackets, supports and finials. A spring tension cord hold down is also included to keep the traverse cord attached to the wall. Sizes range from 28 to 48 inches to 130-240 inches. They are adjustable to fit any size in between without any cutting. If you have a good traverse rod and need or want to convert it to a double rod, this kit is what you need. It has brackets designed to hold a standard curtain rod that mount to an existing Graber traverse rod. Easy to install, save a bundle! A moderately priced motorized traverse rod has been added to the collection at BasicQ. Makita's system is a solid selection for single and double applications. Comes with everything necessary to install, plug-n-play. Thread is a staple of any sewing room whether it is for draperies, upholstery or pillows. Sometimes the item you need can not be found in your local store and this is where BasicQ comes in. We have one of the largest sewing room supplies available for quick shipping to take care of last minute emergencies. Thread, piping, polypiping and weighted tapes are just a few of the supplies waiting for you. Added 2 custom built swing arm curtain rods to the line. One extends 20 inches and the other 36 inches. It comes in over 20 colors and is not your common curtain rod. Use swing arm curtain rods in places that you need to open, like a door, outward from the wall. For heavy duty life cycle, wide widths and ripplefold drapery setup the Kirsch Architrac system is the preferred choice for many workrooms around the country. This curtain rod comes in several styles to fit the most extreme applications. It is available as a decorative or standard style. The decorative style comes in several finishes and you have many finials to select from for the finishing touch. Wood curtain rod poles use wood brackets that mount to the wall or ceiling. They come in different projections to hold the wood rod off the window or wall to clear any objects like window frames. They are normally color coordinated to the wood pole and others accessories. Installation is achieved by two different methods depending on the bracket. Some have pre-drilled holes on the front edge of the bracket that have plugs that install after the screw is tightened. Most have a concealed plate on the back edge. These you fix the screw to the wall and slide the bracket over the screw head to lock it in place. Zippers and other workroom items available for pillows and other upholstery projects. 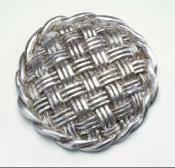 Buttons, thread and pins are among the items found in workroom packages. These are ideal for the do-it-yourself projects or workrooms. Trim, braid and binding is some of the decorative products for finishing off that special project.